The Amazon Echo Spot is the latest version of the Echo line up for Amazon, and it might be the best one yet. The Spot is a blend of the Echo Dot size with an Echo quality speaker, and Echo Show capabilities. The Echo Spot is a round orb with a flat bottom and 2.5" screen that actually can play videos from Prime Video. It takes up just about the same space as an Echo Dot, but is a few inches taller. 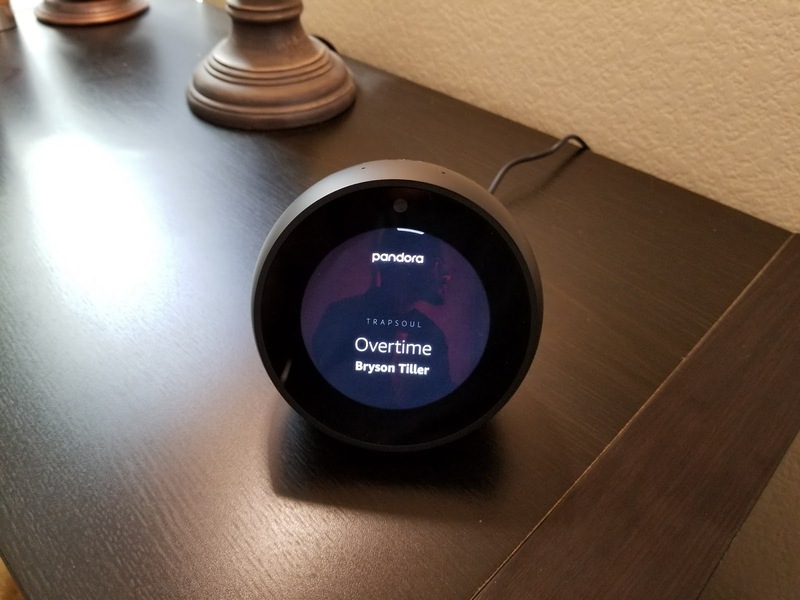 With the screen you get a visual interface for the Echo that displays a clock face, weather, trending topics, and suggestions of what to ask your Echo. The Echo Spot has all the same "skills" as other Echo products. You can ask questions, lock the front door, turn on the lights, play music from multiple sources, set alarms, etc. One thing you can't do is watch YouTube on it. The benefit of getting an Echo Spot versus an Echo Dot that can be had for $80-$100 cheaper is the screen. With the screen it becomes more of a bedside alarm clock than the Dot. Instead of asking what time it is, you can just look at it. Instead of asking what the weather is like, you can just look at it as well. I highly doubt you'll watch many videos on the Spot because the screen is so small and that's probably by design. Inside the box you'll find only the Spot, proprietary cable and typical documentation (get started, safety warnings, etc). I wish the Spot came with a micro USB connector for power like the Echo Dots do, but that's a minor drawback. The Spot has only 3 buttons (volume up, volume down, and a mic and camera mute/pause button. The Spot does have a camera so if you're the type to fear "the man" looking in on you, keep the mute button pressed, and some tape over the camera especially if you use it in your bedroom. The Spot also only has two ports on the back, one for power and a line out jack in case you want to connect it to a better speaker. 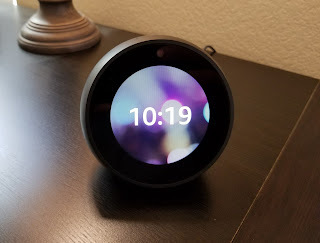 The Echo Spot does have Bluetooth in case you want to connect it to a speaker that way or connect your phone to play music. 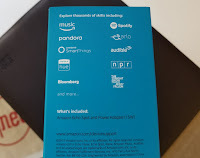 Once you open the box and plug in your Spot you'll be asked to connect it to WiFi which is pretty simple. You're given a basic Android Keyboard that's easy to navigate to enter your WiFi password. Once you get connected to WiFi, you'll get to view an introduction video which goes over way in which you can use your Spot. You can view the video here. When the Spot is connected, updated and ready, you'll be greeted by the clock face which rotates through the 4 main screens. Clock>Weather>Suggestions>Trending topics. You can then say, "Alexa, goto settings" or swipe down from the top to get to the settings menu. In the settings you can change the clock face from 6 different analog or digital faces, and keep or remove the extra screens like suggestions and trending topics. The Echo Spot is one of the coolest alarm clocks you can buy and a cool gift to give, especially next fall when you'll see it for well less than $100. You can hear how loud the Echo Spot is here. You can watch the intro video here. 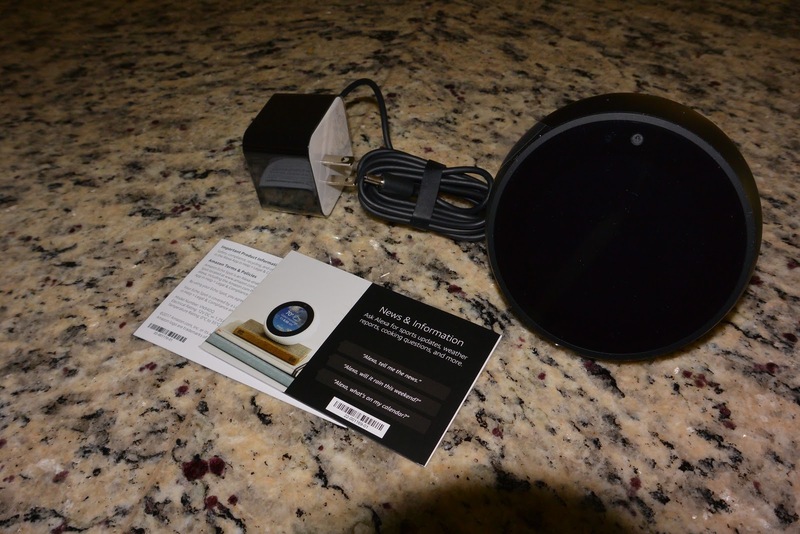 You can view all of my Echo Spot pics here. Thanks for this info. I work in Assistive Technology and often buy many variations of the Amazon Echo products. I'm going to forward this to my clinical supervisor.